The Nemecek Firm offers highly specialized employment-based immigration services to both companies and foreign nationals throughout the U.S. and abroad. With in-depth knowledge of the immigration laws and industry-specific experience in a wide range of industries, the firm is able to able to deliver consistent and successful solutions in a time efficient manner. Premised on an understanding that every case is different, the firm designs customized legal strategies, case management systems and compliance procedures for each client. Whether your organization is a multinational conglomerate or a small firm seeking to grow through foreign talent, The Nemecek Firm committed to providing first-rate representation to meet your business and immigration needs. The Nemecek Firm offers high-quality and affordable representation to U.S. citizens, lawful permanent residents and their family members in the area of family-based immigration. Recognizing the importance of reuniting families, the firm works closely with clients to provide personalized services and alleviate anxiety which is inherent in the immigration process. The Nemecek Firm is experienced in all areas of immigration law and thus is able to spot critical issues in complicated cases which may initially appear straightforward. To promote family unity, the immigration laws provide avenues to permanent residence on the basis of certain family relationships. In general, there are two types of family-based immigrants: (1) immediate relative immigrants; and, (2) preference immigrants. There is no numerical limit on the number of immigrant visas (green cards) available to immediate relatives. This means that immediate relatives do not have to wait in line to obtain a green card. Preference immigrants, on the other hand, are subject to annual numerical limits, which can result in long delays, oftentimes many years. Immediate relatives include spouses, widow(er)s, unmarried children (under the age of 21), and parents of U.S. Citizens (over the age of 21). 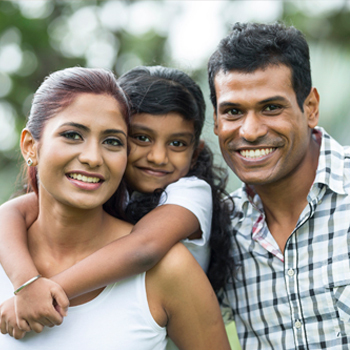 In order for a foreign national immediate relative to obtain a green card, the U.S. citizen relative is required to file a petition with USCIS (I-130 petition). A foreign national who is present in the U.S. may concurrently apply to adjust his or her status to that of a lawful permanent resident (Form I-485), provided the foreign national is otherwise eligible for adjustment. Foreign nationals residing abroad and certain relatives who are not eligible to adjust status in the U.S. may complete immigrant processing at a U.S. embassy or consulate abroad. Foreign national spouses applying for green cards based on marriages to U.S. citizens face enhanced scrutiny. Spouses who apply to adjust status in the U.S. are required to appear for an interview with USCIS with their U.S. citizen spouse to demonstrate the bona fides of their marriage. In other words, they must show that their marriage is not a “sham marriage” which was entered into solely for the purpose of obtaining immigration benefits. Spouses who complete immigrant processing at U.S. embassies and consulates abroad are required to appear for an interview with a consular officer. They must prove the bona fides of their marriage through their responses to questions from the officer and documentation evidencing the relationship. A spouse who has been married to a U.S. citizen for less than two years at the time his or her green card is approved is issued a conditional permanent resident card. The conditional permanent resident card is valid for two years. Within 90 days of the expiration of the conditional permanent resident card, the foreign national spouse and U.S. citizen are generally required to file a joint petition (I-751 petition) with USCIS to demonstrate the bona fides of their ongoing marital union. A waiver of the joint filing requirement is available for cases which present the following circumstances: (1) extreme hardship would result if the foreign national is deported and extreme hardship occurred during the period of conditional residency; (2) the parties entered into the marriage in good faith, but the marriage terminated (i.e., irreconcilable differences resulting in divorce); and, (3) the parties entered into the marriage in good faith, and during the marriage, the foreign national spouse or child was battered and/or subjected to extreme cruelty perpetrated by the petitioner. Additionally, untimely filings may be excused in cases involving compelling circumstances. 1st Preference (FB-1): Unmarried Sons and Daughters of Citizens. 2nd Preference (FB-2): Spouses and Children (FB-2A), and Unmarried Sons and Daughters of Permanent Residents (FB-2B). 3rd Preference (FB-3): Married Sons and Daughters of Citizens. 4th Preference (FB-4): Brothers and Sisters of Adult Citizens. In order for a preference immigrant to apply for a green card, an immigrant visa number must be available for his or her preference category. Because the demand for green cards exceeds the supply, there is a backlog in the availability of immigrant visas for family-based preference immigrants. The U.S. Department of State announces the number of visas that are available for each immigrant visa category through a monthly report, which is called the “Visa Bulletin.” For an explanation of the prefer- ence system and visa bulletin, visit the following link: Visa Bulletin & Preference Categories. Immigration compliance has become increasingly more important for businesses under the current administration, which has implemented new work site enforcement measures to identify and penalize employers that knowingly hire illegal workers. In furtherance of the policies of this administration, Immigration and Customs Enforcement (ICE) issued Notices of Inspection (NOIs) to 652 employers on July 1, 2009. The notices informed employers that ICE will inspect their hiring records to determine compliance with employment eligibility verification laws. This was the largest operation of its kind. On November 19, 2009 – just over 4 months later – ICE issued NOIs to 1,000 employers across the country associated with critical infrastructure. This year, on March 2, 2010, ICE announced the issuance of 180 NOIs to businesses across five states. While ICE’s inspections target employers which have gained unfair advantages through an illegal workforce, an employer may be subject to hefty civil fines for unintentional paperwork violations. In addition to financial losses, civil fines can cause serious damage to the reputation of a business. The Nemecek Firm offers immigration compliance services to assist U.S. employers in eliminating unnecessary risks in today’s enforcement-focused immigration climate. Working in tandem with human resource professionals, executive and managerial teams and supervisory staff, the firm helps companies to develop and implement best practices to achieve the highest level of compliance. The firm’s compliance-related services include: I-9 and E-Verify training; internal audits; policy drafting; representation before immigration authorities in enforcement actions; and, regular legal advice on an on-going basis as needed. The Nemecek Firm is experienced in litigating removal and deportation cases before the Executive Office of Immigration Review and the Board of Immigration Appeals. In addition to aggressively defending clients against charges of removability, the firm offers representation for all forms of relief, including asylum and related benefits, waivers, cancellation of removal, INA §212(c) relief, and adjustment of status. The Nemecek Firm has a profound understanding of the statutory and case law in the context of removal proceedings, which is often complex and changes frequently. This enables the firm to provide winning strategies for cases involving the most challenging and unfavorable fact patterns.